Left to grow out of control, garden bushes and hedges will quickly spoil the tidy appearance of your garden. What’s more, getting them back in shape can be difficult as it takes time and requires skill and knowledge to be done properly and without danger to the plant’s health. 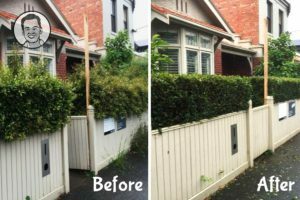 When you need assistance or someone else to carry out your hedge trimming, Paul’s experienced gardeners will get your hedges back in shape. Equipped with professional hedge trimmers and extensions, the experts will take care of the shrubs, no matter the type or size. Why go with pro hedge trimming? Expertly done hedge trimming could work miracles for your entire garden. Hedges are often used to provide privacy but when not trimmed properly they won’t grow thick enough. Overgrown hedges and bushes will hide other plants, get in your way, and generally be a steadily growing thorn in your side until properly trimmed. All the gardeners are vetted and thoroughly trained. They will work closely with you and follow your specific instructions to produce the desired end result. With our help you can ensure that every single hedge in your garden looks at its finest. Count on Paul’s for a proper trimming! Contact us today for a free quote on our services. If your garden needs complete care book hedge trimming as part of our garden maintenance service and we’ll thoroughly pamper your yard!